If you received a tag from a retail location, start here. Bank account information or a credit or debit card is required to complete the process. Tolls accrued on your K-TAG will be charged to your bank account or credit/debit card each month. 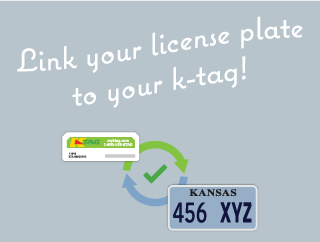 Also available at: K-TAG Retail Centers at Exit 50 in Wichita and Exit 202 in Lawrence (Monday-Friday 8am-5pm, closed holidays); AAA locations in Kansas; The Merc in Lawrence, KS.